Cousins Properties would like to take this opportunity to welcome you to Northpark... one of Atlanta’s premier office park developments. We extend our pledge to provide the finest professional management services through which we hope you will find a unique and exciting place in which to work within Atlanta’s business community. This Electronic Tenant® Handbook has been especially designed to provide quick, useful information about the building’s general policies, emergency procedures, services and amenities. 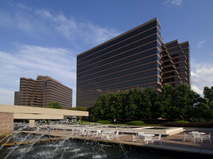 We feel privileged that your company has chosen Northpark. We look forward to a long and mutually rewarding relationship. Please feel free to call us if we can be of assistance to you. This Electronic Tenant® Handbook has special features, such as Email Notification, Instant Alert and a Search engine. In order to take advantage of these useful features, you must have Adobe Acrobat Reader installed on your computer. This software is free and easy to use, and can be obtained by clicking here.